Because We Use Our Feet Continuously, Tendonitis in the Foot Is a Common Problem. One of the Most Frequently Affected Tendons Is the Posterior Tibial Tendon. The posterior tibial tendon runs behind the inside bump on the ankle (the medial malleolus), across the instep, and into the bottom of the foot. 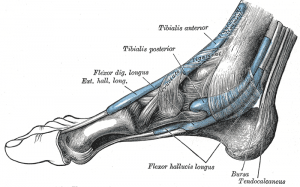 The tendon is important in supporting the arch of the foot and helps turn the foot inward during walking. Problems with the posterior tibial tendon seem to occur in stages. Initially, irritation of the outer covering of the tendon called the paratenon causes a paratendonitis. This simply indicates that there is inflammation around the tendon as it runs through the tunnel behind the medial malleolus. As we age, a tendon is subject to degeneration within the substance of the tendon. The term degeneration means that wear and tear occurs in the tendon over time and leads to a situation where the tendon is weaker than normal. Degeneration in a tendon usually shows up as a loss of the normal arrangement of the fibers of the tendon. Tendons are made up of strands ofÊ a material called collagen (think of a tendon as similar to a nylon rope and the strands of collagen as the nylon strands). Some of the individual strands of the tendon become jumbled due to the degeneration, other fibers break, and the tendon loses strength. The healing process in the tendon causes the tendon to become thickened as scar tissue tries to repair the tendon. This process can continue to the extent that a nodule forms within the tendon. This condition is called tendonosis. The area of tendonosis in the tendon is weaker than normal tendon. The weakened, degenerative tendon sets the stage for the possibility of actual rupture of the tendon. The symptoms of tendonitis of the posterior tibial tendon include pain in the instep area of the foot and swelling along the course of the tendon. In some cases the tendon may actually rupture, due to weakening of the tendon by the inflammatory process. Rupture of the tendon leads to a fairly pronounced flatfoot deformity that is easily recognizable. Diagnosis of Posterior Tibial tendonitis is usually apparent on physical examination. In some difficult cases, an MRI scan may be useful to determine whether the tendon has ruptured, (but this is seldom the case). The MRI (Magnetic Resonance Imaging) machine uses magnetic waves rather than X-rays, to show the soft tissues of the body. With this machine, we are able to slice through the area we are interested in and see the tendons and ligaments very clearly. This test does not require any needles or special dye, and is painless. Treatment of posterior tibial tendonitis begins with a good supportive arch support. The arch support is useful because it supports the arch and takes some of the stress off the tendon. You may need to decrease your activity, mainly the time up on your feet to rest the tendon. Anti-inflammatory medications, such as ibuprofen or aspirin, may be prescribed by your doctor. Cortisone injection in this condition is usually not indicated, due to the increased risk of rupture of the tendon following injection. Some physicians recommend a slightly different cortisone treatment (rather than injection) called ionophoresis. Ionophoresis is a treatment that uses electric current to increase the absorption of a cortisone cream through the skin and down around the tendon where the inflammation is occurring. There is much less of a risk of rupture of the tendon when this method is used. If this fails to resolve the process, surgery may be required to remove the thickened tissue around the tendon. This is done to try and decrease the symptoms of pain and to prevent rupture of the tendon. If the tendon has ruptured, surgery may be required to either repair the ruptured tendon – or to replace it with a tendon graft. Most tears will not simply be repairable, unless they only recently occurred. Usually, another tendon in the foot, such as the tendon that flexes the four lesser toes (bends them down) is used as a tendon graft to replace the function of the posterior tibial tendon. Finally, in cases which have been neglected, and a fixed flatfoot deformity is present, a fusion (or arthrodesis) of the foot may be required. A fusion is an operation where a joint between two bones is removed and the two bones on either side of the joint are allowed to grow together – or fuse. This type of operation is used to stop pain from joints that are worn out and can be used to realign the bones when the normal mechanisms for maintaining normal alignment are lost – such as when the tendons and ligaments no longer work properly. Usually, several joints must be fused to control the flatfoot deformity occurring after posterior tibial tendon rupture. Following surgery, you will most likely be placed in some sort of brace or cast if the tendon has been repaired or grafted. You will probably be in a cast for 6-8 weeks if a fusion has been performed. If you are experiencing the symptoms and pain associated with tendonitis, contact Medical & Surgical Foot and Ankle Care and the medical treatment center of Dr Keith Naftulin DPM. We address all issues associated with bone, tendon, muscle, joints, cuticle and skin. You may also schedule an appointment with the doctor’s office on-line.